Almost 5 years ago I was sitting at the fire station when this weird lookin guy in a camo minivan pulled up. Started talking to us about airsoft. Now we used to play paintball but for one reason or another we eventualy stopped. I started talking to people about getting some guys together to try out this airsoft thing. The first people to go out, the true originals were myself Adam (Lt. Col. CRACKERDOG), James (Col. Bulldog), Jason (Capt. House), Matt ( Maj. Roadblock) and Tom (T.D.). We tryed it and loved it from the first trigger pull. That is your original members. We threw some names around for a while, and Fire Reapers was the first. But it didn't really roll off the tongue. Then F.U.C.O. came about, but not Florida Urban Combat Operations, no no no, it was For Us Crackers Only. Nice right? Then Ben eventually joined the team, and Tom had some personal things going on and couldn't really continue. Then Ben ended up quiting the team for his own reasons . So we were down to 4. At that time I was considered the team leader. It was just fun for us (and still is). We would go out and play every once in a while, but started to fizzle a bit. But James kept us going, finding teams for us to play against, and new places to go. So we as a team decided to make James the new team leader. We got to thinking, we want to take this more seriously, so For Us Crackers Only won't cut it. Well we had already started getting the name FUCO out there. So we had to keep the name, just a new meaning. After many sleepless nights we came up with Florida Urban Combat Operations Now know that at this time we still didn't have a rank structure. Didn't need one. 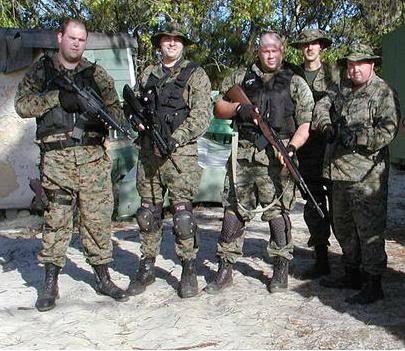 Then last year came Camp Blanding with Operation Blackjack. All I can say is REVITALIZED!!!!!!! James, myself, Matt, and your Staff Sgt. Bill (Deisel, my brother) went. We were back!! Then Ben wanted to rejoin the team, he got his hands on the DAF field. Just before that we started a chain of command. And started bringing on other team members. All of which were friends of ours that we talked into trying it. And a big congratulations to Jim (MacGuyver) and his son Joel for being the first team members who we never knew outside of airsoft. Congratulations because not many people can put up with or understand us fire/EMS types. And to the triple J's that just joined us....having never played airsoft before, you showed us a lot of potential, and we knew that we could "mold you". And I'm glad we brought all of you guys on. Well that's your FUCO history lesson. Every Legend has a history, and this is ours. And it will be a blast making more history as the team we are today. And by the way, Tom (one of the 5 originals) will always have a spot open for him on this team. Thanx for reading, hope you enjoyed!! Thanks for the kind words Crackerdog, you guys have been great!!! MacGyver wrote: Thanks for the kind words Crackerdog, you guys have been great!!! How many team members do you have on FUCO? About 7 core members and more at times when needed.